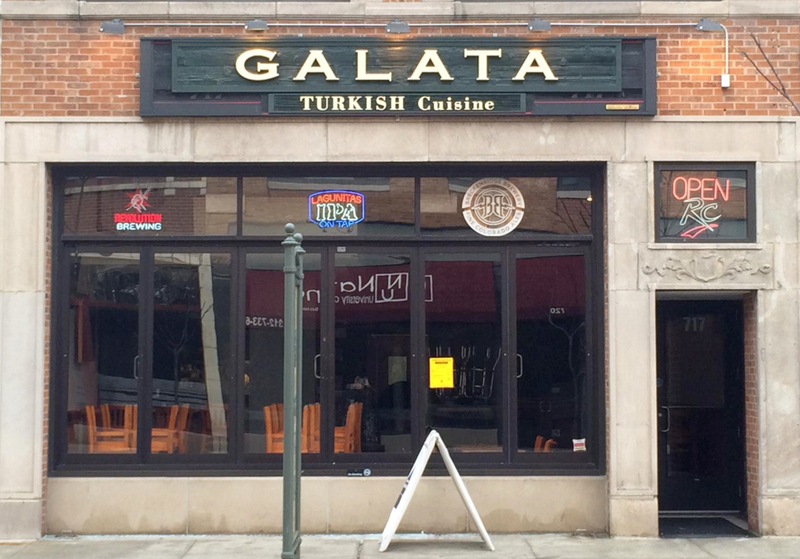 Turkish restaurant Galata has opened at University Village Maxwell Street, the mix of dining, retail and service offerings on the south end of the University of Illinois at Chicago (UIC) campus. Turkish restaurant Galata (http://www.galatainchicago.com) has opened at University Village Maxwell Street (http://www.uvmaxwellstreet.com), the mix of dining, retail and service offerings on the south end of the University of Illinois at Chicago campus. Located at 717 W. Maxwell St. -- the former site of Lucky’s Sandwich Co. -- Galata (312-773-5900) is open 11 a.m. to 9 p.m. daily, serving authentic Turkish soups, salads, mezes (tapas), wraps and platters, all under $15. The restaurant offers delivery, and a liquor license is pending. Owner Zafer Atasoy studied culinary arts in Italy and Turkey, later operating a restaurant in his native Istanbul for seven years. He came to the United States eight years ago to join his wife, who was pursuing her education. She’s now an assistant professor at UIC. “University Village is a great location with a great, diverse customer population,” said Atasoy. He explained that Turkish restaurants are rare in Chicago, and that his is the only one located south of Roosevelt Road. Galata joins dozens of restaurants, taverns, retail outlets, and service shops in the family-friendly destination that is convenient to UIC, the South Loop, Bridgeport, Chinatown and surrounding neighborhoods. Garage parking is available seven days a week and there is easy access to public transportation and major expressways. For information about leasing opportunities at University Village Maxwell Street, contact Yolanda Valle at CBRE, 312-456-7107. Located on the south end of the University of Illinois at Chicago campus – and on the former site of the historic and renowned Maxwell Street open air market – University Village Maxwell Street (http://www.uvmaxwellstreet.com) is a unique and family-friendly shopping area composed of businesses, restaurants, taverns, retail outlets, and service shops. Everything is conveniently dispersed along Halsted and Maxwell Streets, Roosevelt Road, and Union Avenue.